At the recent Democratic town hall, moderator Chris Cuomo presented Bernie Sanders with what has been a common complaint about his presidential campaign: Sanders’s relentless focus on income inequality, in this campaign and through his career, raises the question of whether he is prepared to address the full spectrum of issues faced by a president. But there is a deeper problem with Sanders’s vision of American politics. It is not just that he has trouble talking about issues other than the redistribution of income; it’s that he has trouble conceptualizing those issues in any other terms. His rigidly economistic frame of mind prevents Sanders from seeing the world as it is. 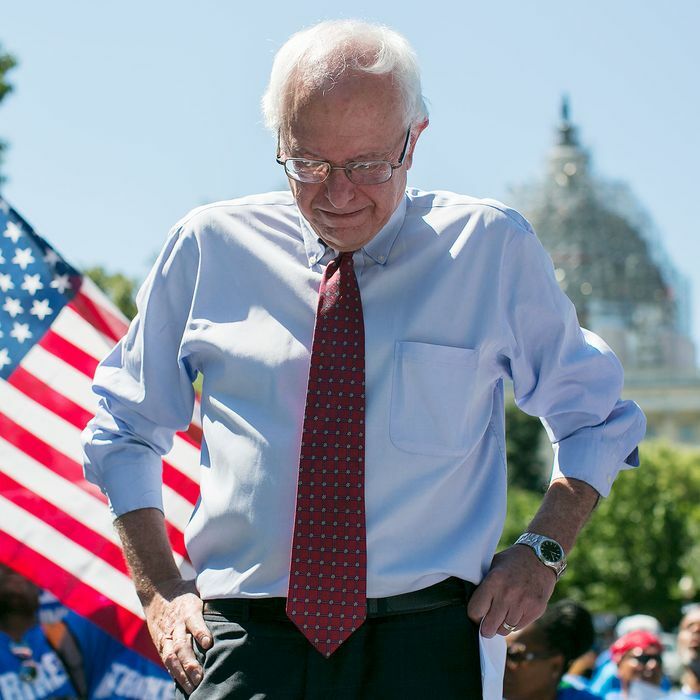 Is Bernie Sanders the New Barack Obama? In my view, you have a Congress today that is much more worried about protecting the interest of the wealthy and the powerful and making sure they get campaign contributions from the wealthy and the powerful. If we are serious about rebuilding the American middle class, if we are serious about providing paid family and medical leave to all of our people, if we are serious about ending the disgrace of having so many of our children live in poverty, the real way to do it is to have millions of Americans finally stand up and say, enough is enough, for people to get engaged in the political process, to finally demand that Washington represent all of us, not just a handful of very wealthy people. Note that Sanders, asked about Republican opposition to his proposals, defined that opposition as “protecting the interest of the wealthy and the powerful.” It is certainly true that fealty to the interests of the rich heavily colors Republican policy. But Sanders is not merely presenting corruption as one factor. It is the entirety of it. Likewise, Sanders has difficulty imagining any reason other than corruption to explain disagreements by fellow Democrats, which he relentlessly attributes to the nefarious influence of corporate wealth. One does not have to dismiss the political power of massed wealth to acknowledge that other things influence the conclusions drawn by Americans who don’t share Sanders’s full diagnosis. In reality, people have organic reasons to vote Republican. Some of them care more about social issues or foreign policy than economics. Sanders would embrace many concepts — “socialism,” big government in the abstract, and middle-class tax increases — that register badly with the public. People are very reluctant to give up their health insurance, even if it is true that Sanders could give them something better. What’s more, the interests of the wealthy do not cut as cleanly as Sanders indicates. It’s true that business and the rich tend to oppose parts of his program like higher taxes on the rich, more generous social insurance, and tougher regulation of finance. But the Obama administration’s stimulus encountered intense Republican opposition even though it did not pose a threat to any business interests. The U.S. Chamber of Commerce even endorsed the stimulus, which profited business both directly (by pumping billions into contracts for projects like infrastructure) and indirectly (by goosing public demand for its members’ products). That did not stop 100 percent of House Republicans from opposing it. Nor did the unified opposition of the business lobby dissuade Republicans from holding the debt ceiling hostage in 2011, or persuade them to pass immigration reform in 2013. Sanders currently proposes a massive infrastructure program, which would make lots of money for the construction industry. Clearly, subservience to big business only goes so far in explaining Republican behavior. It is not only Republican voters whose ideas Sanders refuses to grapple with. Here he is in the previous debate explaining Republican climate-science denial: “It is amazing to me, and I think we’ll have agreement on this up here, that we have a major party, called the Republican Party, that is so owned by the fossil-fuel industry and their campaign contributions that they don’t even have the courage, the decency to listen to the scientists.” It is surely true that fossil-fuel contributions have encouraged the spread of climate-science denial. But the doctrine also appeals philosophically to conservatives. It expresses their disdain for liberal elites, and, more important, it justifies opposition to government action. Psychologists and social scientists have poured years of study into identifying the causes of climate-science denial. One does not need to harbor even the slightest whiff of sympathy for climate-science denial to grasp that its causes run deeper than a cash transaction with Big Oil. Figures like George Will and Charles Krauthammer dismiss climate science because it is a way to maintain order within their mental world. Many other conservatives have social or professional reasons to believe, or at least to say, that Will and Krauthammer are serious intellectuals rather than loons spouting transparently preposterous conspiracy theories. There are deep tribal influences at work that cannot be reduced to economic self-interest. Sanders’s story provides a comforting fable for his party. Not only are Democrats not hemmed in by the Republican hold on Congress, but they don’t even need to do the laborious work of persuading the political center to come to their side. They need only to rise up and break the grip of moneyed interests on the political system. There are many reasons to doubt Sanders’s promise that he can transform American politics. Perhaps the most fundamental is that he does not actually understand how it works.